Immunogen Purified recombinant fragment of LIN28 (aa93-209) expressed in E. Coli. Formulation Antibody are purified by protein G affinity chromatography. Liquid in 0.01M Phosphate buffer, pH 7.4 containing 0.03% sodium azide. LIN28: lin-28 homolog (C. elegans), also known as CSDD1, ZCCHC1. Entrez Protein NP_078950. LIN28 was first discovered in the nematode C. elegans. It is a heterochronic protein in C. elegans involved in the timing of developmental events and choice of stage specific cell fates. LIN28 expression has been found to be regulated post-transcriptionally by miRNAs in both nematodes and mammals. In humans it is expressed in embryonic stem cells and its expression decreases during differentiation. It is negatively regulated by retinoic acid in neuronal differentiation. 1. Dev Dyn. 2005 Feb;232(2):487-97. 2. Mol Cell Biol. 2005 Nov;25(21):9198-208. 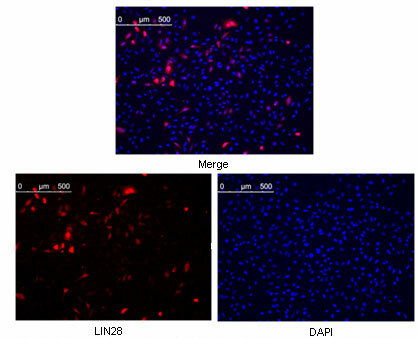 Figure 1: Western blot analysis using LIN28 mouse mAb against NTERA-2 cell lysate (1). Figure 2: Confocal immunofluorescence analysis of methanol fixed Hela cells were transfected with pMX construct of human LIN28, cells were analyzed ~62 hours after transfection. Figure 3: Confocal immunofluorescence analysis of NTERA-2 cells using LIN28 mouse mAb (green). Blue: DRAQ5 fluorescent DNA dye.